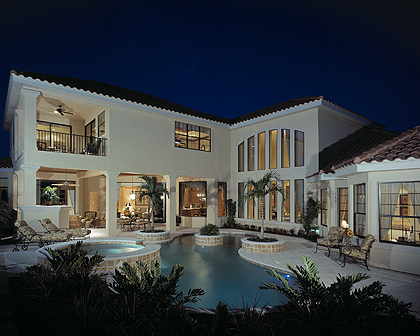 A two story version of our Grand Floridian Model. Living Room and Family room plan with 4 bedrooms, 5 full baths, one powder bath, Front Study, Rear Study. 3 car side loaded garage. Mediterranean styled elevation. Grand Entrance with 22’ high ceilings at Grand Salon. Master Bedroom with private Retreat at rear. Oversized His and Her closets. Master Bath with water closet and bidet. His and Her showers. Front Study and Dining Room showcases unique beamed ceilings. Large secondary bedrooms with walk in closets and en-suite baths. Angled Leisure room for extended rear views. Upstairs features large Game Room with Wet Bar, dedicated Home Theatre and Guest Bedroom with access to Covered Terrace.